Hawai‘i farmers, teachers, legal and medical experts and community activists share their perspectives on GMO’s (Genetically Modified Organisms), the genetic engineering of crops and the patenting of life forms. Earthjustice has won lawsuits in federal and state courts challenging the introduction of these experimental crops in the islands without first assessing environmental and human health impacts. Islands at Risk looks at possible health impacts from exposure to biopharmaceutical crops, both in humans and endangered species. Family farmers express their concern over the genetic contamination of regular food crops such as papaya, taro, coffee and corn. Kānaka Maoli (Native Hawaiians) recount their attempts to prevent the patenting of taro, honored as an ancestor, and assert their right to protect the biodiversity of their lands, crucial to health and survival. 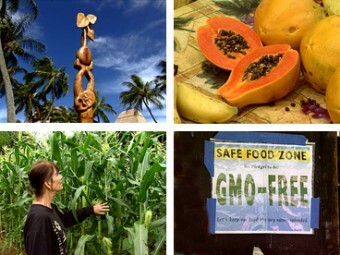 The video also addresses the impact of genetic engineering on food security and the world’s future ability to feed itself.